...says Annika Stensson, spokeswoman for the National Restaurant Association, in an article in today's New York Times. The article, Ginger Ale Without the Can, touts the many benefits of homemade soda — simple, natural, delicious, and locally-made. Stennson also observes that "Homemade sodas seem in step with the growing menu trend toward simpler, more natural foods, as well as a rising interest in locally made artisanal products" Homemade ginger ale, in particular, is praised for having a "lively bite," making it an appealing mixer in summer cocktails, or a refreshing, non-alcoholic drink on it's own. 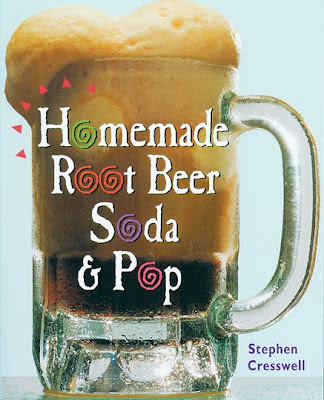 While the Times article includes a recipe for ginger ale adapted from New-York based drinks master Sasha Petraske, those looking to expand their repertoire of homemade sodas might want to check out Storey's Homemade Root Beer, Soda & Pop, which includes 60 easy-to-follow recipes for traditional and modern soft drinks. Why stop at ginger ale when you can make Virgin Islands Ginger Beer, Mulled Ginger Apple Ale, Ginger Pop, Chinese Ginger Beer, or Ginger Lager? Also included are instructions for crafting delicious batches of root beer, birch beer, sarsaparilla, cherry and cream sodas, coffee whizzers, fruit smoothies — even dandelion champagne, an interesting way to convert a yard full of weeds into a delicious and satisfying drink this summer. Cheers! A few weeks ago I had a mojito that had both ginger and mint in it (actually they called it a ginito) — it was fabulous! I never considered making my own ginger ale before, but after experiencing the great flavor of fresh ginger in a drink and the inspiration from this post and from the Times article, I am motivated to try it for myself. And you used your new title!!!! I'm very proud. I've been noticing a lot of articles about "signature cocktails" and custom cocktails at trendy watering holes; local soda is the perfect base. Kristy, that "ginito" sounds perfect right now.